Isha Foundation’s environmental initiative, Project GreenHands, is organizing an 8-day Natural Farming Training Program by Mr. Palekar, an expert in natural farming techniques. Isha Foundation’s environmental initiative, Project GreenHands (PGH) is organizing an 8-day Natural Farming Training Program by Mr. Palekar, an expert in natural farming techniques and is sponsored by SONY India Pvt Ltd. If you know why natural farming is better than conventional methods and would like to register for the workshop, skip to the end of this post and download the form. If you’re wondering what all the hoopla about natural farming is, read on for more context! Today, the Indian agriculture sector has come to be dominated by the model pushed through during the Green Revolution in the 1960s. While there are many aspects to the Green Revolution, one major factor was the move away from self-sufficiency, towards increased inputs into a piece of farmland through irrigation, pesticides, fertilizers, and hybrid seeds that could not consistently breed well from generation to generation. While the country as a whole experienced an increase in yields and total production for certain crops such as wheat and rice after the implementation of these schemes, there were many problems associated with the model. It was not very sustainable or ecologically friendly. For example, pesticide consumption in our country increased from 2330 tons in 1950 to 198,000 tons in 1997-98, drastically increasing the prevalence of these chemicals in the food chain. It is notable that many of the pesticides were manufactured in USA and Europe, where ammunition manufacturing units were converted to fertilizer and pesticide manufacturing plants. For instance, “Agent Orange” a poisonous chemical used to clear bushes and find enemy hideouts in the Vietnam War is now used in many developing countries as a herbicide. This is despite the fact that this chemical is suspected to cause prostate cancer, respiratory cancers, multiple myeloma, type II diabetes mellitus, Hodgkin's disease and many more ailments. This system is also mostly partial to farmers who are already well off and have access to finances and irrigation, rather than the small and marginal farmers or those dependant on rainfall, who make up most of India’s farming community. Smaller farmers who took loans to afford the necessary input costs in terms of pesticides, fertilizers, pump sets etc. would often end up embroiled in debt if the crop failed. Besides these issues, policy decisions encouraged farmers to focus mainly on a few crops, rather than maintain diversity in agricultural productivity. The agricultural sector also began a largely disorganized attempt to move from subsistence farming to cash cropping, which created its own set of problems. And lately, climate change and extreme weather events have only added to the havoc. According to the Global Climate Risk Index, India is one of three countries affected the most by extreme weather in 2013. The net result is a deadly combination of debt, crop failures, suicides, poverty and migration to urban areas that have drastically curtailed the quality of rural lives. For example, though 55-60% of India’s workforce is engaged in agriculture, it contributes only 14% of India’s GDP. India’s GDP grew by 7.2% in 2014-15, but agriculture grew by 0.23% [at 2011-12 prices], and foodgrain production fell by 5%. National Crime Records Bureau records show that at least 284,694 Indian farmers have taken their lives since 1995. That means on average, a farmer has committed suicide every 30 minutes. Other indicators also throw light on the worsening situation of farmers in India. 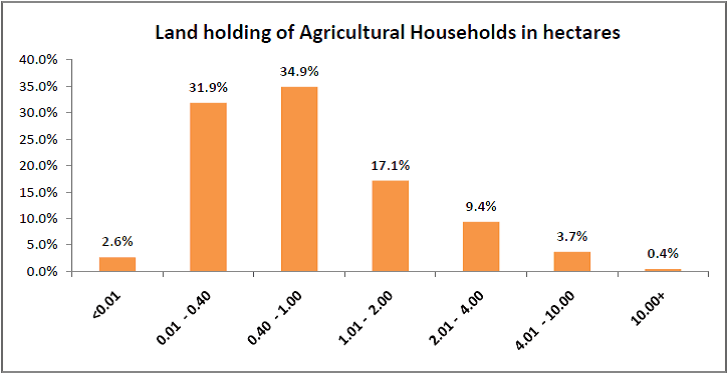 The average size of landholding in India is 1.06 hectares. Even with irrigation – and only 37% of India’s cultivated land is irrigated – it is hard for a family of five to live well on such small holdings, unless crop yields are increased drastically at no cost to the farmer. In fact, the per capita consumption of cereals declined by 13% from 468 gm/day in 1990-1991 to 412gm/day in 2005-2006. Foodgrain availability declined by 4.5 per cent between the two periods of 1991-2000 and 2001-2005. Per capita foodgrain availability in 2002-03 was estimated to be at similar levels to what prevailed just before World War 2! It is not unusual to find families whose nutrition levels are worse off than convicts! Several important crops have seen a dramatic decline in production. Take the case of ragi or finger millet, which has been referred to as a super-cereal with great potential to improve India’s nutrition situation. 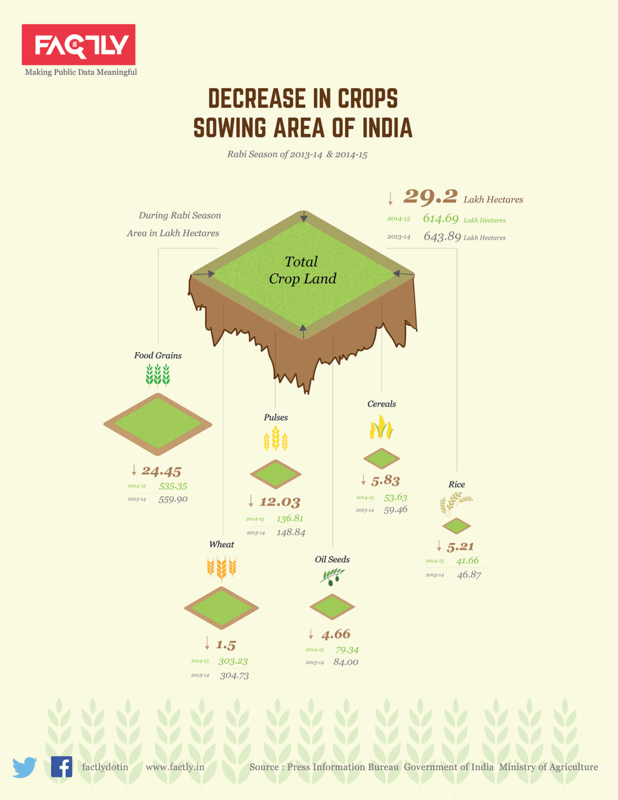 In 2013-14 India’s ragi production stood at 90,000 tonnes or just 5% of 1998-99 levels! Many experts have voiced concern that persisting with this model of chemical agriculture is counter-productive in the long run and can cause irreparable damage. Vijay Mahajan, founder of livelihood promotion institute Basix, sums up the problem of farmer distress in an interview to MoneyControl. 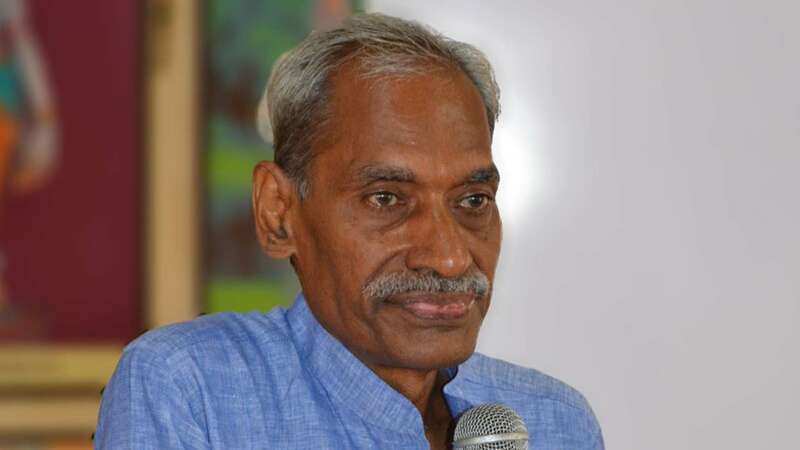 According to him, farmer distress has been increasing in general, year-on-year, mainly due to the reduction in per capita land availability and the breakdown of support structures such as ground water depletion, silted canals, spurious seeds and erratic electricity supply. The farmer’s very approach to agriculture has also been affected. According to Mahajan: “By offering subsidies on various things like fertiliser, water, electricity, credit, what has happened is that the proud and self-reliant Indian farmer has been made into someone who is constantly expecting some doles.” What is needed he points out is a different approach to helping farmers out of this vicious cycle. This is where initiatives like Zero-Budget Natural Farming (ZBNF) come in. 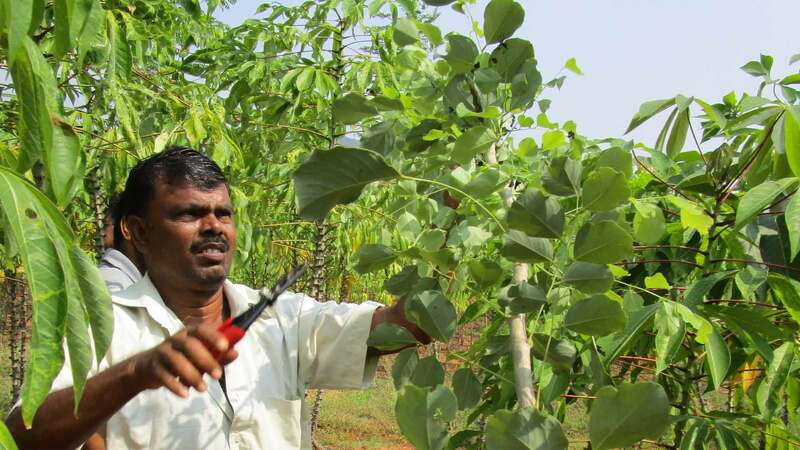 Begun by Subhash Palekar, an agricultural scientist who promotes and actively educates farmers in natural farming techniques, ZBNF involves methods that require no cost input from the farmer’s side in terms of pesticides, fertilizers or even irrigation. Natural methods are used to retain and improve soil health, control pests, and increase yields. A farmer will also be able to produce his own seed, and natural fertilizers are created using cow dung, cow urine and other materials. According to Mr. Palekar, one native cow is all one needs to take up this method of farming on thirty acres of land. Mr. Palekar hails from the state of Maharashtra and is fondly called the “Krishi ka Rishi” or the farmer’s sage! He has trained over 4 million farmers in the last two decades on these sustainable, eco-friendly farming techniques. He was honoured with the Bharat Krishi Ratna award and the Basava Shri, which includes the Dalai Lama and Anna Hazare among its recipients. Beejamrita,the treatment of seeds, seedlings or any planting material with a natural concoction to protect the crop from harmful soil borne and seed borne pathogens during the initial stages of growth. Jeevamrita, which is introduced once a fortnight into the farm to promote biological activity in the soil and make nutrients available to the crop. Mulching with organic residues to reduce tillage, suppress weeds, promote humus formation and enhance the soil’s water-holding capacity. Mixed cropping and cultivation of diverse species of crops depending on site-specific agro-climatic conditions, to buffer against total failure of a single crop and widen the income source of farmers. The Administrative Training Institute in Mysore has conducted a study on the feasibility of ZNBF and how it has helped farmers in Karnataka who adopted it. In its report, it states that before they adopted ZNBF, farmers found that conventional cultivation methods were very cost-intensive. By farmers’ own estimates, the cost of cultivation of one acre of paddy was Rs.5000-6000, that of sugarcane Rs. 15000-20000, and of banana Rs. 25000-30000. All the farmers selected for the study agreed that switching over to the new method from chemical agriculture paid good dividends. Savings on the cost of seeds, fertilizers and plant protection chemicals has been substantial. After adopting ZNBF, the sample farmers acknowledged it was farmer-friendly and financially viable. However, during the initial period of transition to ZBNF, the results will not be encouraging because of the lingering effects of chemical farming. The results will become evident only after adequate mulching and restoration of biological activity in the soil. Patience and perseverance are required, they said. Treatment with Beejamrita and Jeevamrita was extremely encouraging in successful cultivation. Beejamrita was noted to give adequate protection to crops from insects and diseases during the initial stages of germination and establishment. Mortality in case of treated crops was negligible. Mulching promotes humus formation, suppresses weeds and greatly reduces the water requirement of crops. Live mulching particularly with leguminous crops is a subsidiary source of income and also a safeguard against depletion of nutrients by crops. Mixed cropping particularly with short duration legumes, vegetables and even medicinal plants has expanded farmers’ income sources. Vegetables rich in vitamins and minerals are generally marketed after adequately providing for home consumption. Some cultivators earned Rs. 15000 by planting Ashwagandha and Coleus in one acre as an intercrop with sugarcane. All the farmers selected for the study agreed that switching over to the new method from chemical agriculture paid good dividends. Savings on the cost of seeds, fertilizers and plant protection chemicals has been substantial. Almost all the farmers have stopped borrowing crop loans. Crop yields have been optimal with possibly no decline in future, because of continuous incorporation of organic residues and replenishment of soil fertility. With a vision to build a community of natural farmers, Isha Foundation’s environmental initiative, Project GreenHands (PGH) has organized an 8-day ZBNF Training Program by Mr. Palekar. This program is structured to train farmers completely in the science of ZBNF, so they will be capable of practicing these techniques upon completion. April 22 is Earth Day. Here’s a little background about the event, and a story from Sadhguru telling us how this is significant for a seeker.